My priority is to deliver quality care to my patients in a comfortable, welcoming setting. I am passionate about helping all of my patients, especially those with anxiety about dental treatment, to overcome their fears, and receive the dental care they need and deserve. Your dental health is such an important part of your overall health. Cosmetic dental problems can be crippling to your self-esteem, and impact your life in so many negative ways. My purpose is to turn that negative into a positive, and help my patients achieve the healthy mouth and confident smile they deserve. For many of our patients, this is nothing short of life-changing. My greatest sense of accomplishment comes from seeing tears of joy in my patient's eyes after remedying a lifetime of dental problems. We believe that informed patients are better prepared to make decisions regarding their health and well being. That is why we've included an extensive section on this web site covering the full array of topics associated with dentistry and dental diagnoses and treatments. We encourage you to look through these pages whenever you have an interest or concern about your dental needs and care. I am always happy to answer any questions you may have, or offer you advice regarding your best treatment options. The best care in the world doesn't mean anything if you can't access it. At our office, we strive to make our New Bern office as efficient and convenient as possible. We keep our atmosphere welcoming and friendly. Included in these web pages is information about our office, including our location, maps, directions, hours, insurance policies and appointment scheduling. You can even email an appointment request right here - Let's get started! "The day of decision is the day to act upon it." - Anon. 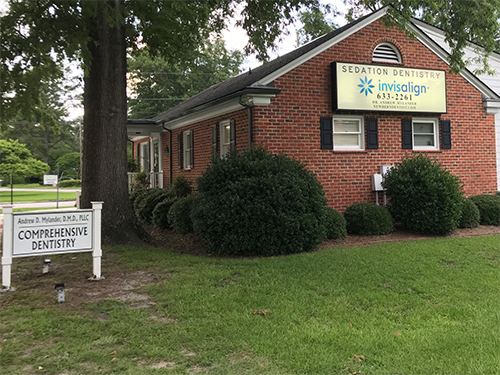 Dr. Andrew D. Mylander is a General Dentist providing all phases of Family, Sedation and Cosmetic Dentistry, serving all of Craven, Jones, Pamlico, and Carteret Counties. Dr. Mylander is a licensed dentist in the state of NC, and is State Dental Board-Certified in providing moderate conscious sedation for his patients. He is also a Premier Preferred provider of Invisalign Orthodontics.